Pure Michigan is shining under bright sunlight on this cold winter day. On the slopes of Boyne Mountain, skiers and snowboarders carve their way downhill. In the nearby Gaslight District of Petoskey, servers steam milk for lattes or pour craft beers with winking names like Trophy Wife Blonde or Cabin Fever. It’s the slow season for sure, but the Up North paradise at the tip of the lower peninsula still draws visitors and their bulging wallets. A few miles away in Alanson, the Church of the Nazarene is about to open its doors for the weekly food distribution. Volunteers gather in a circle to pray before admitting those who’ve come for a box of donated groceries. The line has begun to wrap around the wall of the multipurpose room. Pastor Catherine Greenhoe looks at the people in sweatpants and shabby overcoats, some holding laundry baskets to carry home their cans and boxes. Three counties ‒ Charlevoix, Emmet and Cheboygan ‒ sit at the tip of Michigan’s mitten, looking out on glistening waters, looking in on a restless, largely invisible population still grappling with unsteady wages and the haunting sense that opportunity ‒ at least, for them ‒ has passed. Solutions do not come easily for thousands of such families, as they labor in the shadows of a tourism economy that comes out to play only a few months a year. In this series, Bridge chronicles the journey of workers, business owners, students, families and community leaders in the three counties. In the process, we hope to look beyond the frustrations and traps of life on the margins and consider policies and programs, both inside and apart from government, that offer promise when working hard is not enough. Those at the top rank among the wealthiest in Michigan. Median income for the top 5 percent of households in tourist- rich Charlevoix and Emmet counties is well above the average in the rest of the state, according to the Census Bureau. The poorest, those in the bottom 20 percent generally are faring better than their peers elsewhere in the state. But the gap between the top and the bottom, in Charlevoix, Emmet and Cheboygan County is among the widest in Michigan. April Keller remembers when she was hired at American Spoon Foods 15 years ago. She was 25, had recently become a single mother, and was working as a cook at a bar/restaurant in the area. She was earning $6.75 an hour and worked nights and weekends, standard for restaurant work. When she was hired at American Spoon, a Petoskey-based purveyor of expensive jams and preserves, earning $9 an hour for regular daytime hours, no weekends, and year-round, she figured she’d lucked out. “Prior to that I had entry-level jobs, worked for minimum wage, the kind of jobs you do when you don’t have a degree,” said Keller, who eventually worked her way up to co-managing production at American Spoon. That’s the way it is for people like her, she added; many in her extended family would be considered working poor, and simply expect seasonal jobs and regular layoffs. “You have to do more than one (job) to get by,” she said. In Charlevoix-Emmet-Cheboygan, more people are tumbling into poverty even years after the depth of the economic downturn. The conditions aren’t extreme when considered against the rest of Michigan ‒ in comparison, Emmet’s poverty rate is low and Charlevoix’s is average, though Cheboygan’s is far higher. But poverty in Emmet and Charlevoix has grown faster than the average among all Michigan counties since 2009. The ratio of Emmet and Charlevoix families with children living in poverty increased by one-third in that four-year period. In Cheboygan, poverty had risen 10 percent by 2013 with 26 percent of families with children in poverty. The three counties lost 3,603 jobs in manufacturing, construction and natural resources between 2000 and 2013, according to an analysis of federal Bureau of Labor Statistics supplied by Scott Gest, regional planner for Networks Northwest, a 10-county planning body. In the same period, 2,272 jobs were added in services, including 573 in leisure and hospitality, which are far more likely to be seasonal, he said, and by definition, part-time. Manufacturing plants like Continental Structural Plastics in Petoskey and Dura Automotive in Antrim County closed in 2007 and 2008, respectively, taking with them 400 jobs. With few alternatives, idled workers either left the region for better prospects or fell into long-term unemployment or underemployment. More ominous, the region could be facing a less robust economic future as young professionals look for work elsewhere. The Charlevoix-Emmet-Cheboygan region lost a staggering 22 percent of people in the coveted 25-44 age group between 2000 and 2013. Justin Rashid, who founded American Spoon, the company that saved April Keller from the minimum-wage merry-go-round, said he understands why some people leave. Even as some workers leave, manufacturers like surgical instrument maker Precision Edge Inc. in Boyne City and DCL in Charlevoix, which makes dust control and loading systems, say they have good, well-paying jobs they can’t fill for lack of qualified skilled-trades employees. Transportation can be another barrier to employment. For workers, particularly at the lower edge of middle-class wages, who live miles from their jobs, the cost of commuting can eat a large chunk of their budget. It is an especially critical obstacle in Emmet County, which lacks a robust transit system. And looking into the future, children attending schools in the counties’ rural districts face twin obstacles ‒ poverty at home and tight budgets in the classroom ‒ as they study to meet the challenges of a competitive job market. In some sense, much of this is nothing new in a region of nearly 85,000 people spread out over more than 3,000 square miles. Resort areas have always had seasonal economies. Rural areas have always had fewer job opportunities. That’s the price residents pay for glorious summers by blue bays and the chance to be paddling a kayak down a river 15 minutes after punching out of work. But with fewer year-round jobs available that allow a middle-class standard of living, the gap in these counties may only grow. Consider, for example, the schools. According to the Michigan Department of Education, rural Inland Lakes Schools in Cheboygan County spent about $8,500 per pupil in 2012-2013. About 20 miles due west, the more affluent Harbor Springs School District spent over $12,000 per pupil, allowing its students to learn in smaller classrooms, among other advantages. About 60 percent of Inland Lakes students qualify for free or reduced-priced lunch, a common measure of poverty, and the districts sends just over half its students to college. Harbor Springs’ poverty rate is half that of Inland Lakes; and Harbor Springs sends more than 8-in-10 of its students to college. Just outside Onaway, a town of about 900 residents in Presque Isle County, Tom Moran, owner of Moran Iron Works, was having trouble finding qualified welders for his growing business in Cheboygan County. A custom fabrication firm, its recent contracts include a $4 million order from Shepler’s Ferry to build a new ferry to Mackinac Island and a $50 million project for Consumer’s Energy to build a greenhouse-gas reduction duct. “They’re just not teaching this in the schools,” he said. So last year Moran spent more than $1 million to open the Industrial Arts Institute in Onaway, an all-day, 15-week training program that teaches all aspects of welding. Fifteen students graduated in November. All got jobs. Networks Northwest, the planning body that includes Emmet and Charlevoix, is planning this year to launch a $3,000 scholarship skills training program for 25 high school students, largely funded by a $65,000 grant from the Michigan Economic Development Corporation. It will combine high school career technical training with community college class work and internships with area employees. The Northern Lakes Economic Alliance, a business support group based in Boyne City, operates a mobile computer-controlled machining training lab, with 12 work stations, that can be driven to companies to train employees and high schools to bring students into 21st-Century entry-level manufacturing jobs. A few young professionals who left have returned, determined to forge a place in this region’s future. They include a former dance instructor who returned to buy a small bookstore in Harbor Springs, now flourishing, and a former ski racer and employee of the 2008 Obama campaign who came back to start an Internet business incubator. There is a common refrain among many of the young in this region: I like it here, but I may have to leave. 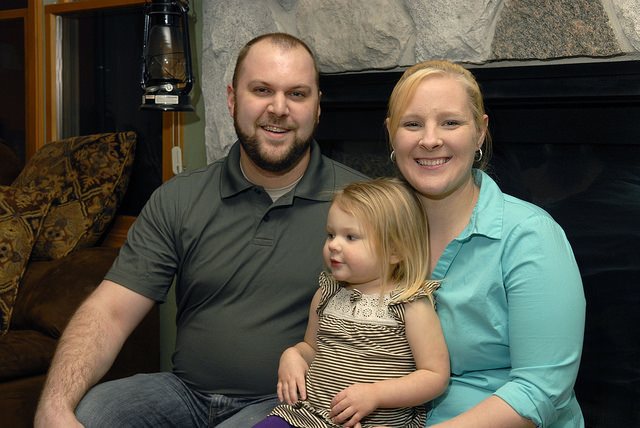 Danielle Wager, 30, was born and raised in Charlevoix, graduating from Charlevoix High School and Grand Valley State University with a degree in education. She was hired in 2007 to teach social studies at Charlevoix High School but was laid off in 2009 amid budget cuts. The Charlevoix resident finally found work helping clients determine if they are eligible for welfare with the Michigan Department of Human Services, while her husband, Kreg, works as a child protective services specialist for the state. They have a daughter, Nila, 2, a mortgage and a tight budget on their $75,000 joint income. “I have been looking for a teaching job ever since I was laid off,” Danielle Wager said. “We're at the point where we are thinking of leaving the area or leaving the state. It's just so hard to find a good-paying job here, especially for someone who has an education. “We both grew up here. My husband is a big skier and snowmobiler. We love the small-town feel without being tiny. I like the solution of Tom Moran, who couldn't find qualified welders: Open up a welding school. Rather than lament the lack of qualified workers, he found an ingenious solution. Would that there were more entrepreneurs like him. I, too, appreciate his entrepreneurial spirit. But, with all the money invested in our educational systems, why aren't those experts coming forth to train workers? Most community colleges have always had welding and other technical programs. Where are they when needed? There used to be shop 'apprentices'. But when you kill the unions, you kill the good jobs and futures. Unions made this country strong for many years. But the rich got greedier and convinced the people the unions were bad. It's a sad situation now. A horrible way to learn a lesson. Technology wiped out the unions so did Union corruption ! do not just blame greed !!! I too applaud Tom Moran. Now others should follow his lead. Its the gooold-fashioned Apprentice concept. As a Language Arts teacher, I've fough a losing battle with FL high schools to offer technical writing for starters, and expand into trade-related courses and programs such as those created by Moran. This is common practice in Europe and Asia. And would that welding was still taught at high schools-- as many "skilled trades" once were! I will be anxious to have you actually come to Paradise, Michigan to do this story. There is no shopping mall in the U.P., and only 2 escalators. Reconcile that with Ann Arbor and Lansing. The U.P is an underdeveloped paradise - waiting for attention. I couldn't agree more. Curious as to why the articles stopped at the bridge. All the problems you relate go double in the eastern UP and most other counties in the UP as well. These are hard-working, resourceful people who often work several jobs when they're available. Tourism and logging aren't enough. My recommendation would be for those hardworking people to relocate to places with jobs. Don't give people false hope of economic development that will never come. Help them find true opportunities in places that need workers. Not that easy to leave when it's the land your grandparents bought with GI paychecks sent home during WWII, and the community that held fundraisers for your scholarship to community college, and the extended family that means you have a cousin in every third U.P. town. Leave for a job with a company that doesn't know me or my family? Live in a city where my kids might have the latest clothes, but they never see their grandparents? Not much of a trade off for a "steady job" and some extra money. Rather chop some more wood and McGyver-rig the truck so it runs another winter, and be thankful for what I have, which isn't measured in the size of a paycheck. You,5th Generation Up, are truly blessed! 5th G UP, I read that you have a hard time leaving a farm that was made possible by your ancestors who left the UP to pay for it. There's a message here. It's no secret that many in the UP live there despite employment opportunities, or lack of. The pride of rugged individualism, living away from the "rat race", having room to roam, all come at a cost, a cost that has to be weighed against the urbanization of "paradise". I have to agree with you. Making more money at the expense of leaving family and community who has been there for you is not an option. Trying to find and do something that will bring in extra income and get businesses to come to your area would be ideal. Get a government in Michigan that will help to create a better business climate, but not at the expense of the workers. Hope things work out for you and your family. Well said. The old of argument of " just leave" is a lame cop-out. I understand where you're coming from. My daughter is the 7th generation in my family to live in Charlevoix county - and my family network is a huge part of what keeps us afloat. From having family babysitters so we don't have to pay for childcare, to renting-to-own from my grandpa - living near family has provided us with assistance and opportunities that most people our age, in our income bracket couldn't dream of. However, sometimes we dream of moving closer to the action of a city, a place where we could bicycle everywhere, where people are more open minded - we are in our 20s, after all. But this seems like an impossible thought without the family assistance that we have here, and it would never be right for me to sell this property to some random person. However, obligation is not the only thing keeping us here. In this place, our daughter can play outside, explore the forest, and build snow forts with no fear of strangers. We are able to keep goats and chickens here. There is no bustle, no zooming vehicles, no light pollution - just trees, stars, cows. We have a small tight-knit community of friends - we get together for crafting, canning, hikes, pot-lucks, and all sorts of rad stuff. My family comes together every spring to taps trees and make maple syrup. These things are priceless. My partner and I have also been lucky enough to find decent wage employment from upstanding local employers - but our income, by no means, allows for extravagance. I am grateful for my family network and community in this area - and extremely proud to claim such a long history here. To those of you with a "just move away for better opportunity because money" opinion - you are the people that I stay here tucked in the woods to avoid. You sound like yu have found and appreciate the many strong reasons to stay. All the best to you and yours! You go where the jobs are. My grandparents left their home, family and country to come to the United States for Jobs. These people are complaining about having to leave their Home towns? Go where the jobs are, don't expect the Government to feed you. Well said. It's a tough trade off. For sure. Thank you for sharing, you definitely have your priorities right! Making a conscious decision of where you place value, despite the difficulties life may bring, you're teaching your children and family what is most important. Not that my opinion matters, I just wanted to tell you that I admire and respect you. Dear Mr. Reality. So if no jobs,just move,leave your whole life,family friends. And if you are one of the working poor how do you manage to move,get a new place to live? Hire or rent a truck to take your belongings with you..? Clearly you are not poor. I left 20 years ago! Although I had a house full of furniture and closet and dresser full of clothes, I left with a bag barely bigger than a briefcase. I'm by no means rich today, but I don't hurt for anything. My house is now paid for, so are my two vehicles, two motorcycles and a hand full of toys! I love my family and miss them much, but I couldn't live in the those conditions then and won't today or put my children through that kind of "rough life". Cool, so I guess you'll be here looking after my aging mother then? You can just go ahead and send all your information....please be prompt, I'd like to move to one of these places you spoke of with the great economy. The places who welcome outsiders into high-paying jobs. Anyway, thanks for the great solution to my problems, and thanks for volunteering to look after mom while I'm away working. To Mr. Reality: Are you Donald Trump in disguise? You obviously have no idea how life is lived in our Northern Michigan towns, or our unique UP. I challenge you to trade places with me for a day & then we'll have a real chat about things that matter. Moving takes money. And a vehicle. Not everyone has that, especially if you are in poverty. Also: college degrees and education do not mean you will get a good job. I know plenty of folks with one or more degrees (two and four year colleges) stuck working multiple low paying jobs. Except that there are jobs in these areas and if you look around town, there are signs everywhere...Hiring. Pay is below a living wage, and there's very little options for renting a place to live. The rentals are summer homes where people want $1500 plus per week during the summer months. Some will rent for less in the off season, but then the off season renter cant afford the rent when the employers need the workers. Moving away to a more lucrative area is a good idea, but it doesn't solve the problem. The area needs workers that are willing to wait tables, manage restaurants and shops, pump gas, etc. And they need places that are affordable for those workers to live. My son works at large organic farm in Suttons Bay. He was lucky enough to rent the one house in Suttons Bay from a property owner that is willing to forgo the big summer rental money to supply a place to live for the workers that serve the wealthy vacationers and feed the community. Those types of property owners are few in number. It has always been this way. The Great Lakes region has always been the summer playground of the more affluent. Year round residents have always either embraced this reality and lifestyle, or moved to where more opportunities exist. Nothing new here. Carol: The analysis "stopped at the bridge", because there isn't the huge presence of summer "one-percenters" (sic) in the U.P. to support the "Income Inequality" meme. Charlevoix/Emmet/Cheboygan is blessed with the summer crowd, which adds dramatically to the local economy. There is also a smaller influx of skiers in winter. Seasonal work trumps no work. There are also a huge number of modestly affluent folks who chose to retire here, and contribute immensely to the economy (and to the charitable support systems). That said, the article did note some bright spots. Entreprenuers who can avoid the seasonal swings do well here. There are a lot of folks in "poverty" (as defined by the federal govt), who have a homestead, are proud and manage just fine. Without a "struggle". I wish more people weren't preoccupied with promoting envy and focussed more on sound market-based economic development. Yours is the best comment on this article. What, exactly, does income inequality measure? Who cares if my neighbor makes 10 times what I do? What matters is can I house, feed and clothe my family. My neighbor's income has no direct impact on what I earn, so why should I care? There was a utopian time in America for those worried about income inequality. It was a time when the US had the lowest rate of income inequality in our history. For most Americans this time was no utopia but a hellish time that no one would like to see again. Yes, I'm talking about the Great Depression. When times are bad we have less income inequality. Why would anyone suggest that it is a good measurement of the economy? The only purpose of measuring income inequality is to create resentment and jealousy of the "Capitalist Class". It is a useless leftover from Marx. I think they stop there Carol because of the big money people that own homes there. I'm from Munising where people also survive on the tourist trade and even though there are wealthy people in town, it hasn't been the problem that you see in Grand Marais for example where people rent their houses to the wealthy but seasonal help cannot afford to stay there. The same thing has been happening in West Branch on the inland lakes forever. Michelle, Pretty easy to reconcile, no jobs, no money, no reason for a mall or any other development. The best thing for people who want those things is to move to where those things already exist. There is at least one mall in the U.P. : the Westwood Mall in Marquette. There are several empty storefronts within, but new businesses are filling some of those spaces. My best friend lives in Paradise, and while it's a nice place to visit, I could never live there. There us nothing. I don't even like the shopping in the Soo. The only place I Could live would be Marquette, where I lived when I went to Northern in 1974-75. That is a cool place to live. I would live there again if my husband would agree to it. He went to Tech, but he hates the cold even here in Muskegon, so don't think I'll ever get to live in Marquette. yeah the upper peninsula is very undeveloped...but the cost of living up there next to nothing. Property values are next to nothing up there as well. I went to school at michigan tech and was up in the UP for years and its amazing but everyone is forgetting the key fact of this article. The reason there is such a pay discrepancy is because there is NO white collar jobs or industries other than tourism in these areas. I'm from Petoskey and have had this talk with my wife....if you don't own your own business or are in the health care profession your never going to make enough money to live in this area due to the cost of living. I'm from owosso Michigan living in Texas, My husband would love to live in Pardise Michigan, it's beautiful there, we don't know if we could afford housing there. The key word is 'paradise'. Be careful what you ask for. You don't want malls, mega stores etc. You have Utopia. I've driven M68 from the freeway east to Rogers City a number of times and the poverty is not hard to see, little towns like Tower and Afton are just depressing to look at, I have often wondered what do people up here do for a living? Its no surprise that young people are leaving, relatives in Rogers City say that many of them see no future up there. I grew up in Tower and went to school in Onaway. I decided to enlist in the army and went off to basic training the shortly after I graduated. After my initial three years I left the army and returned home. I spent months looking for a job, finally lansing a seasonal job at UPS in Petoskey. The gas I used ate up half my paycheck. After nine months out of the army I signed back up. I've been in for 11 years now and I have access to so many opportunities I wouldn't have had if I remained in the area. I'm recruiting out of Traverse City now and I often enlist young men and women from small towns like Mancelona, Bellaire, Elk Rapids and more. Many high school kids want to get out of here so they don't get stuck and end up a struggling parent of three, trying to support them by working for years at the local gas station. People will keep leaving unless good, entry-level jobs become more plentiful. Until that happens I'll keep doing my best to remove young people from these communities and provide them the opportunities they deserve. "In the old days".... Employers routinely would train HS grads to teach the skills they needed. Why now, do the "Job Creators" need government to do it for them? Hats off to Tom Moran for finding a private sector solution! Each one teach one is a great idea, but when the business barely sustains one or two employees, the time and investment necessary to train a young person to the point where he or she can be useful and not break the machinery can be prohibitive. Hats off to Tom Moran! He has been well known as a honest, hard working business man! A very smart one too! We are lucky to have a man of his stature in Northern Michigan who actively invests in the area! We need more like him! It is not free for students with Tom Moron. Just talked to someones son doing it and they are paying $12,000.00 for the program. I hope that you're not expecting it to be free. And it's Moran, not Moron. $12,000.00 is a small investment in one's future. If someone is motivated they'll find a way to pay for it. I agree, this is a small investment in learning a life time career. It will pay off. Thank you for setting up a great hands on education for our area. 12,000.00 for 10 weeks? Ludicrous! My son learned how to be a welder on line. Great your son learned how to be a welder online. But I'm sure this course takes you through hands on training and on top of that certification requirements. I can watch a youtube video on how to weld but its more of an art than a trade skill as being a good welder takes time and practice and someone to actually say thats a good weld. If you just want to learn how to spot weld thats great but you won't be qualified to be a welder and get paid. I paid 65,000 for my engineering degree and am now paying over 100,000 to change major to a health care profession that will pay 130,000 a year. .....so if 12,000 is too much to invest in your education over the next 50 plus years then don't be surprised if you can't find over a $10 an hour job. Welders are some of the highest paid skilled trades jobs. I bet one can make $80k in their first year. $12,000 sounds like a bargain to me. Lived in Manistee for 10 years. Moved near Ann Arbor for jobs and much better schools and opportunities for our kids. No regrets.... Yes, its beautiful up there, but you can't eat trees. Up North and the UP are better off with fewer people up there anyway. Tom Moran did an admirable thing that he needed to do to save his company. If you think about the economics of making such an investment, not many businesses can afford to make that kind of commitment. 15 employees for a million dollar investment, that's $66,666 each if he keeps them all. Apparently it works with $54 million on the books for Tom but those orders are far and few between in Northern Michigan so don't think this is any real solution to the problem. "All got jobs." Where? What was the entry level-pay? How did they cover the $12,500 tuition? The IAI website lists a consumer loan through the Awakon Federal Credit Union as the only source of tuition financing. Can any of their students actually qualify for a consumer loan? If so, what is the interest rate and the REAL cost of the education? What will be the local and regional opportunities for these new welders to broaden their entry level skill-sets and earn higher wages, or is this just enough "education" to get them stuck in a repetitive, task-based, $9 an hour job just long enough until they become bored, frustrated, and quit, and the next newly skilled employee to be on-boarded? The cycle continuing. Kudos to Mr. Moran for providing the capital outlay and the initiative to build a school to solve the need he perceived. What troubles me from a consumer standpoint are the sketchy details in the program flyer regarding what students actually get beyond instruction and class time. A "certificate of completion" means little to an employer with regard to competency and does little to help a person land a job. And "registration with the AWS as meeting the AWS QC11?" What does that mean? Registration is not a certification or credential? Also, "Certified Welding Educators/Inspectors will also provide opportunities to certify in numerous welding processes and provide certification cards to qualifying students." WHICH processes? Are these "opportunities" included in the tuition? If so, how many attempts does a student get to certify? Who are the employers that are hiring these grads on the back end? What interviewing and employment test skills do students exit with? Most students embarking on an entry-level career or education don't know how to dig deeper to see the value (or lack thereof) of what they will receive in exchange for tuition. Some welding students just can't weld. Are they assessed at some point and given honest feedback with the choice to continue, or does IAI just accept the tuition and let a student they know has little hope of being a welder continue down a path to nowhere? To someone with knowledge in workforce education, on the surface this institute looks to be little more than an overpriced mill for certificates of achievement. If not, they need to show it. An ED with the background of Georgia Abbott cannot come cheap. Neither can having a separate business manager, an institutional effectiveness director, and 4-5 CWI/CWE's on staff. The ratio is almost 4:1 student to instructor if I understand the model correctly. So what is the student really paying for; administration or the opportunity to learn a trade with a REAL chance at employment and financial growth? I know it sounds like it, but I'm not trying to beat up the IAI here; just point out they have a perception problem which they share with nearly all post-secondary institutions. These "schools" should be aware that they need to make the outcomes clear for the not so savvy consumer. Most students embarking on an entry-level career or education don't know how to dig deeper to see the value (or lack thereof) of what they will receive in exchange for tuition. The school may very well be legitimate and its intentions noble. Put up some numbers. Be very explicit about what students get with an AWS "registration" and "opportunities" that are inclusive and non-inclusive of tuition. It is difficult to tell from the marketing. I hope you can share your thinking, ideas and concerns with the Michigan State Department of Education. Employers and students need recognition of education outside normal venues. Thanks for the energy you have already contributed. $65,000 grant for 25 students, I see nothing about how the performance of this initiative will be evaluated. Just that everyone is overjoyed that more government money is funneled in to feel good programming. Tread lightly as you discuss these poor unfortunates who "labor in the shadows" of the wealthy. Many of us choose to live in these "undeveloped areas" because we enjoy the low cost of living; we appreciate that there is no "keeping up with the Joneses" like you'll find in the cities of Michigan. Of course, enough income to provide for yourself and your family is a necessity. But please, don't insult us by saying the areas would be improved by a shopping mall. Not having one keeps us from spending our hard earned money on frivolous items. Comparison is the thief of joy. Low cost of living what not what we found. We could shop at the local Glens, and pay at least 30% more for food, or make the 60 mile round trip to Meijer and pay less. And it wasn't always about keeping up with the Jonses. Dog food? TC or Petoskey. Doctors? TC or Kalkaska. My husband and I lived in the middle of our jobs, but it was 20 miles there and back each day. We both lost our jobs in the area and had to move, but haven't found that down state living is costing us much more. Our gas bills are down by half, our cars require less maintenance. Living up north when gas was approaching $4 a gallon made life there very expensive. The cost of living in northern Michigan is significantly higher than many other places in and out of Michigan. Gas is always higher, groceries more costly, utilities more, especially in the winter. It is the end of the line so to speak, therefore the everything costs more because there is limited returns when shipping to northern Michigan. And the UP is even more costly for the same reasons. I lived there for over 20 years and my husband was born and raised there. We left in 2010 and the cost of living where we live is much better. There are more opportunities in this area for young people. I worked white collar and in the tourist industry. My husband was blue collar and went through a plant closing There are benefits to northern Michigan but it is very expensive. I watched the gap between the haves and have nots grow while I was there. Tom Moran's idea is a great solution and more employers should follow his lead to help fill many needs of the area. Oh I love that, comparison is the thief of joy... I lived in Detroit for 12 years, suburbs of Detroit for another 27 years and then moved west to the shores of Lake Michigan but on the southern end. It is like another world. It has pros and cons. It is tough to find work, commuting long distance is a factor, but I have to say, those commutes might mean I can't get a big screen TV this year but I had (retired now) a much bigger screen by having to deal with less traffic and getting to notice the beauty around me as I drove my peaceful 30 miles one way. I would take my large mug of hot coffee and head out on back roads often making the first tracks before dawn. You never knew what wonder you would witness that day, might be a huge deer having a Mexican standoff with you on the road, might be the sun shining through the branches of the forest you had to drive through, could be the frost on the trees over a pond that cast a beautiful pinkish purple glow, might be a hawk circling for an early morning meal, these were strange but beautiful sights that I never got to see on my many city/suburb commutes. Maybe it is that I started in the city and ended up here, but all I know is, I appreciate it. I chose the UP precisely because of the remoteness, lack of shopping malls, keeping up with the neighbors attitude. I love the sense of belonging and caring in small towns, and the sharing and caring that is old fashioned and lost in most of this country. Please DO NOT think of yoopers as in any way deprived ! The RICHNESS in life here is often missed by those who see success measured by their paycheck. D. I think you are not alone in your thinking...Appreciate your comment. I enjoyed this article. One part of the story that's missing is the main/root cause of poverty: Poor personal choices. It's not all the fault of businesses leaving or poorer school districts. Let's put the responsibility on the individual, too. If you make the choice to not graduate from high school and bring a child or children into this world before you are prepared to provide fully, without government assistance, you will struggle and your children will struggle. That goes for both males and females. If you bring a child into this world, you should be prepared to work and provide. There is no mention about the personal choices or lack of self discipline that perpetuates generational poverty. There is also a drug abuse problem up here, just like all other places in the country. Drug abuse kills hope, makes people desperate, hurts the whole community. We, as a community, DO need to mentor and offer avenues to learn skilled trades and everyday budgeting/financial skills. I applaud Mr. Moran for his efforts and to others who make an effort to help young people get on their way to stable employment, and it doesn't matter the skill if it is in demand. There is not a job in the private sector up here that is not necessary, so helping people realize their work is very important to their employer and customers is essential. But, it takes someone to express it. So far as D. Case's comment, I can completely understand his viewpoint. Many are here to live a simpler life. I don't miss having a mall in my life. Malls do not interest me. We moved up here 20 years ago so we could exhale. We aren't part of the top 5% or the bottom 20%. We just are and live accordingly, helping where we can and appreciating the blessings of living Up North. I concur that personal choices are the key to a satisfactory and happy long term future. There are consequences associated with poor decisions and no amount of government aid can fix them completely. This should be a major theme taught to our children beginning in middle school. They need to learn what it costs to obtain the lifestyle they desire. Are they willing to work 80 hours/week to achieve economic success OR is it more important they have time to hang out with their buddies. All those high income residents didn't get there by winning the lottery or having a money tree. They got there by being willing to work harder and smarter than their peers. They sacrificed early on to reap the rewards of their efforts. Let's start teaching this concept to the young people growing up here at the tip of the mitt. Astute observations expressed within your comments!! I was intrigued with this entire article, having grown up in Cheboygan County and graduating from Inland Lakes High School in 1965. You are to be commended for expressing your understanding of our society as it is today, and basically how it got in the sad condition it is today. Poor personal choices is not the root nor cause of poverty. Instead, socio-economic factors are. To imply that people are here for a simpler life implies that they have a choice to do so, and many don't. It's important to look at and understand the systemic functions of the area, its history and culture, to fully understand its poverty. You know what the definition of EQUALITY is? It's having an equal OPPORTUNITY as opposed to an equal outcome. In any region, county, city, state, there will always be those who are more successful than others. The common denominator? ATTITUDE and motivation. It's to the point in many Michigan communities that its so much easier to live on a EBT than to get up every day and go to work. THAT is the mindset, that of generational welfare, that must change. And YES the MEDC needs to go away. There is no reason to be picking industry winners and losers. Put that money back into the general fund and fix the roads. Innovators will still innovate without tax dollars. Choice is definitely a factor! Growing up on a dairy farm with a parent who had an 8th grade education, I clearly remember deciding in the 7th grade that a scrape-by life was not for me. As an educator, I've seen far too many kids put their heads down in classes, only interested in who was dissing who on facebook that day. It may be cultural and a learned behavior, but then why did I notice it so young, and why do so many others not? Choice and personal responsibility are factors that society can't control; I only wish more kids would see the possibilities for themselves and take the steps to achieve them. I was a classroom teacher for 30 and a half years!!!!!!!!!!!!! No one put their head on the desk in my class! Why would you admit children sleeping in your class???? Perhaps you are a part of the problem!!!!!!!!!!!!!!!!!!!!! Del, that comment was really unfair. "Fifteen students graduated in November. All got jobs." It would have been helpful to know many were enrolled at the beginning of the fifteen weeks. The article says, " Inland Lakes Schools in Cheboygan County spent about $8,500 per pupil in 2012-2013," while "the more affluent Harbor Springs School District spent over $12,000 per pupil." I would have liked a detailed breakdown of the discrepancy. As I recall, the difference between the lowest and highest state funding per student is only a little over $1,000. What explains the rest of the difference? The article also says, "About 60 percent of Inland Lakes students qualify for free or reduced-priced lunch, a common measure of poverty, and the districts sends just over half its students to college. Harbor Springs’ poverty rate is half that of Inland Lakes; and Harbor Springs sends more than 8-in-10 of its students to college." So 40 percent of Inland Lakes" student are non-poor and the district sends fifty percent of its students to college, while seventy percent of Harbor Springs' students are non-poor and sends over eighty percent of its students to college. It would be of considerable interest to know what percentage of the non-poor students in each district went to college. In other words, what role does a family's culture play in a student's success? The article also says that several manufacturers "say they have good, well-paying jobs they can’t fill for lack of qualified skilled-trades employees." Why? Is it as Mr. Moran says, “They’re just not teaching this in the schools,” ? Have we, in the name of "equality" placed too much emphasis on everyone going to college at the expense of teaching blue collar skills? After recounting income statistics for Charlevoix and Emmet counties, the article goes on to say, " But the gap between the top and the bottom, in Charlevoix, Emmet and Cheboygan County is among the widest in Michigan." Why? How is the median income of the top five percent relevant to the poverty of the bottom twenty percent? Does the article mean to say that the bottom twenty percent have low incomes because the top five percent have high incomes? Isn't that an expression of the "peasant mentality" that contends that society is a zero sum game, where one person only has more at the expense of someone else? Charles, Harbor Springs is not within the state funding formula due to the unusually high number of affluent (mostly second) homeowners in the area. Because of this, they spend more money, per pupil, than almost any other district. There are other districts that are "out of formula", Glen Lake and Mackinaw City being other examples. Jared~It's my understanding that operating expenses for schools are no longer based on property taxes. That changed with Proposal A during Governor Engler's administration, so schools in affluent areas are no longer "out of formula". School districts can still pass millages for construction of schools, renovations, etc. Also some districts have private foundations by which donors can contribute money for educational purposes. Your information is incorrect. After Prop. A passed, there was a provision that allowed districts which had more "non-homestead" residential property than "homestead" property to keep a certain amount of the difference in collected property taxes. We are close in Charlevoix but not there yet. That is why Harbor get to spend way more per pupil for teaching activities than any other district in our ISD. As for mileages, you can pass them for building projects, transportation and technology, but not to hire or pay for teachers or classroom supplies (other than technology items). With transportation costs, the way we fund our schools is poor, at best. Your ability to recite but ignore content is a concern. And the answer to your question is "yes". There are no panaceas. Effort is needed on a variety of issues--macro-economic, homelessness, mental illness, pre-and post-natal care, drug rehabilitation, public education, police community relations, excessive incarceration for minor offenses, and so forth. In 50-odd years living in the Detroit area I've never seen so many homeless individuals begging at intersections throughout the metropolitan area. Perfect examples of "mother government" trying to remedy the consequences of poor choices, mostly by young folks. Every "issue" mentioned above is the result of careless, selfish people making babies, which turn into people (imagine that!) and dumping the financial responsablilities of raising them on reaponsible folks. Add on top of that a defiant attitude that they have a "right" such financial aid, babies of their own and free health care. The accepted "welfare life" narrative needs to be killed, shunned and swept away. It was born or at least greatly enhanced as a result of Johnson's naive "great society" programs. If not naive then just selling our future for votes. I would love to see a little information about the numbers in the Eastern Upper Peninsula counties of Luce, Mackinaw, & Chippewa compared the same way to those three counties mentioned in the article. THAT would be interesting. Perhaps those numbers would be interesting, but the "Sunrise Side" does not have all the $10 million dollar homes just across the road from all the double wides like we do over here. That is what he is trying to address in this article. 75K - Sob! That is a good living wage - how can one actually find that a difficult wage to survive on unless one is living beyond their means.... WOW! I thought exactly the same thing. Maybe they can't afford new snowmobiles on $75K income. $75,000 and don't consider that good pay, and hard to get by on?? Get real! I'm a School Bus Driver, 9 months of the year, try for seasonal, and take it when I can, get by best I can when I can't find summer work. My approximate school wages? Around $15,000. Now that's hard to get by on. ANd there are a whole lot of people that you wouldn't even know about just like me. But I love my small town life and wouldn't it trade it for big city "opportunities" and all the higher cost of living that would go with it. Hey, can I come to the defense of the couple you guys mention? I don't think they were sneering at their combined incomes or saying they could barely survive. What they are saying is that they've had trouble getting jobs, with one of them already laid off from her teaching job, and have had to make due with other jobs that aren't necessarily what they want to be doing for the rest of their lives, or at the income that they think they can achieve elsewhere. That isn't a whiny or ungrateful attitude. To my mind, it's a young couple that loves this region, but is weighing the benefits of moving somewhere else to provide a better financial future for themselves and their young child. Lansing community college has an excellent welding program. Perhaps a model for the area. Write for more information. Cost, length of program, guaranteed jobs at completion? I hope that the second part of the article addresses the impact of having so much wealth near so much poverty, for example, how affordability of restaurants, groceries, and other common goods are affected. Further, how much the economy kowtows to the rich at the expense of the poor. There's a blindness and disregard to the other half, the half that aren't permanent residents, who don't give back. This is their vacationland, not their reality. A lot of those vactioners are former residents who left the area and have now retired and returned! Doesn't mean they are all wealthy, but perhaps have saved and planned for retirement. They certainly contribute to the economy! I have similar thoughts... how much to "second-home" non-residents or vacationers contribute-- or take--from the communities they enjoy part-time? I have a small "vacation home" (not in prime Northern MI area); I pay taxes, of course, but don't vote in local elections and don't really understand local community concerns. I don't support much local economy except via taxes -- everything costs way more than in the Detroit area. It doesn't mention the part about how the people that do get hired in the summer quit as soon as they are able to collect "underemployment" from the government. Nor does it mention the hundreds of Russians and Jamaicans that are shipped in to work in the towns and on the island because the residents don't want to work. They've become accustomed to living off of the government. The unemployment is only available if you have worked in at least four of the last five quarters. The imported laborers only have employment for four/five months--no benefits, and of course never qualify for unemployment. Back in the 1980s I was in Mackinaw City and went into some souvenir shop and the person behind the counter had come from Poland for the summer to work at that job. I think they had some program at the time for seasonal workers from other countries to come in, I'm not sure if they still do this or not but it seemed kind of unusual to me. Were there not enough locals to fill those jobs? I would be interested in seeing a survey which shows what relationship there may be between poverty and broken homes. Historically, children learn their work ethic from their parents, and frequently learned their trade or occupation from their parents as well. There is no tuition, no student loans, no academic failure in family training. The people who settled those counties one hundred and fifty years ago lived off the land and built with their hands. Schools were rudimentary and libraries limited. Today, there is Wikipedia and Google. Learning is the cheapest thing to do. The Northwest Ordinance assertion, which remains part of the Michigan Constitution, tells us "Religion, morality and knowledge, being necessary for good government and the happiness of mankind, schools and the means of education shall forever be encouraged." Our forefathers never dreamed that the means of education could be so cheap and universal. I would be interested in seeing more diverse articles. Often people focus on the tourist destinations such as Traverse City or Petoskey. Why not write an article on Benzie or Manistee Counties? Lake County? More diversity in terms of interviewing, GLBTQ population, migrant populations, minorities, People of Color, and the first people of Michigan - the Anishinaabe. I am mixed race and of Anishinaabe heritage. I reside in Manistee. I am young, educated with a Masters degrees, and have my own consulting business. I focus on the most marginalized populations in MIchigan. Wealth disparity is huge in most Northern Michigan communities. But we as Anishinaabe people have a different worldview on dominant culture/mainstream views. My tribe is located way up the the UP. I live in Northern Michigan because it is actually Anishinaabe Aki and my home. I've also lived in poverty to live here and dealt with a plethora of discrimination because I am who I am. Imagine how migrant workers feel? How the Anishinaabe feel? How a gay couple feels? How a multi-racial couple feels living in Northern Michigan in poverty, in a trailer in the back back woods... just think outside your box. The bridge needs to bridge these gaps in their stories. There is another aspect of this economic divide that drives youth away, which I think the comments touch on well. There is a pervasive social divide in a culture that believes dogmatically that poverty is an indication of ignorance and laziness more than lack of opportunity. Why would I want to return to a place that never wanted me? For me, living in a city isn't just about job opportunity, it's about cultural diversity and tolerance, both of which were sorely lacking in my childhood. It's the ability to tell someone my name without having them make snap judgements about my worth. When you grow up being told that you can never amount to anything and then go off to college and see how much bigger the world really is than the small people who tried to make you feel smaller, you don't want to move back with your degrees, no matter how pretty and peaceful it is. There are plenty of wonderful, educated, forward-thinking people up there, but the people who think the solution to every problem is to shake a finger at the poor and tell them they made bad choices and now they just have to live with the consequences either don't understand or don't care how poverty cycles actually work, and being barraged with that sort of judgemental rhetoric left far too bad a taste in my mouth for me to ever want to live there again. I'm not alone. Most of the people my age that I have stayed in touch with have left, and many don't even want to visit, it's just too depressing to see such sharp dividing lines between the classes and be reminded that you were one mistake away from being another statistic. You ask why your educated youth are leaving? For those of us who grew up below that arbitrary poverty line, my answer is because (unlike our parents) we can. Down in rural poverty areas of Kentucky they have an expression "living outside your upbringing" or something like that where they are judgmental of people who leave and make a success of their life, it sounds like something similar going on in parts of Northern Michigan as well. Under those circumstances I couldn't blame someone for not wanting to come back. The wages for welders in NW Michigan have fallen in the last eight years. Anyone not burdened with an upside down house equity will wisely look elsewhere. Certainly a lot of divergent views expressed regarding this article. On the one side there are expressions of how frustrating it is to make a living up north, and on the other side many opinions about how the people living in poverty are to blame for being poor. Too many poor choices. Too much government dole. Should just move somewhere and get a real job. The fact is that the upper 5% can use drugs voraciously and not be blamed for being poor. Employers paying minimum wages are using the government to subsidize the working poor and contribute to the cost of our socialization. There is a very real and growing income disparity, not just in these three counties, or in Michigan. Since the economic collapse of 2009 the growth in poverty has been huge, and the growth in the concentration of wealth at the top even greater. If you look at a graph the income growth at the top scales up at about 45 degrees. Yet we blame the poor for our problems and think government spending should be curtailed and taxes cut. How so? If the top 5% paid double the tax rate they are paying their income would still be growing at 22.5%. The bottom 80% are making less than ever before. Personal decisions? Yes we all need to make the right ones. And we also need to invest in every part of our society. Education. Infrastructure. Economic development. Healthcare. Even our roads, God forbid. And those who are benefiting from the best decisions need to pay more and stop complaining about the less fortunate. Chances are, however you make your money, it involves large concentrations of small payments from someone else. If you don't like socialism, don't reap the benefits of living in a great society, pack up and move to a small island.You will probably have to rely on someone else making bad choices to bring you food and water. I grew up in Bellaire in Antrim County. After moving to Chicago, and California, I eventually settled back in Michigan, but in Detroit. For me, the lack of opportunities that I had as an honor student made me ache for the day I could move away. Yes, the area is gorgeous. However, the lack of upward mobility and specific opportunities in Northern Michigan made me happier in the Detroit area. Most of my family resides in the Traverse City area. However, most of them are business owners and have inherited their businesses from past generations. This has allowed them the lifestyle that many young professionals have to move away to find. While the area is growing, it isn't growing at the rate that it is producing young people, yearning for careers that are capable of supporting a stable lifestyle. I can appreciate the hard work and sacrifice that people make in order to live in the area. Personally, I am happier in the Detroit area, for I can have the beauty of this state, the excitement of the city, and am mere hours from "home". I don't have to look too hard to find a good paying job and have so much at my finger tips. Everyone has their own specific needs and wants and for those who want to live Up North, the cost of stability is much different than those of us city dwellers. It's a great place to grow up, but in my mind, does not offer enough opportunity for all of us. Some large Mfg. companies should slow back on their "Hard Nosed Hiring Requirements" Many of our debunked farming communities such as Cheboygan area has some of the best, and hardest working people around. People can, and want to learn. Start Educational programs, share-a-ride incentives, profit sharing, etc.... make it work people. It can be done. WHAT ABOUT THE U.P., Are we just invisible to you Trolls ??? It is sad that Precision Edge cannot fill those skilled jobs, because they were one of the recipients of the Michigan Strategic Fund for tax abatement. You folks need to visit Antrim County where the unemployment rate is well above the national average; where we vary in high income levels around Torch Lake, a mainly seasonal home area, to Mancelona where the Dura automotive plant went south a number of years ago. There are two food pantries, a Baby pantry which distributes free clothing, food, diapers birth to age 6 and raises funds for cribs and car seats to keep children safe. We serve a free community meal at my church every Tuesday to 60-90 people. The largest employer in Antrim County is Shanty Creek Ski/Golf resort and most jobs are part time, seasonal, minimum wage jobs. We have many Working poor. When income levels area averaged it doesn't look to "poor" because of the income levels of Elk Rapids and Torch Lake areas. What we need in Michigan and every other state is not a minimum wage but a LIVING WAGE for all. I just moved to Ann Arbor after raising my 5 children in Harbor Springs for 18 years..10 of those years as a widow. I moved because I was exhausted from working in my field (politics) and having to drive to Lansing weekly to keep my job. Most people who work are the " supporting cast" to the resorters and tourists who enjoy the great playground that is Northern Michigan.These are great hard working people but the low pay and lack of affordable health care, transportation and even finding the basics make it incredibly challenging. The poverty that exists just 4 or 5 short blocks inland from the bay is silent to those who visit ..most are unaware of the wide disparity. Answers? Income disparity is a national issue but local legislator need to take heed or get voted out and replaced by those that recognize the critical issue. The cost of living in northern Michigan is significantly higher and puts a great burden on everyone, but more specifically the working poor. My husband was born and raised in northern Michigan and I lived there for over 20 years. The difference between the haves and have-nots changed significantly while I was there. I had a great white-collar job where my hours were cut. My husband worked at one plant for 13 years and that plant closed down and the jobs were shipped out of state and out of country. He found another job at another factory but they were always fears of the plant closing down. We ended up leaving the state to find jobs and to better our children's opportunities. When I was looking for a new job there was literally only eight jobs listed in the classified section and the majority of them were for teachers or nurses. When I was looking for a new job, at one point there was literally only eight jobs listed in the classified section of the Petoskey News Review and the majority of them were for teachers or nurses. When I moved to northern Michigan in the late 80s, a saying that I heard for the first time became very evident. The phrase is "a view of the bay for half the pay." Prices for gas, groceries, housing, and overall goods are significantly higher than they are for downstate and even higher than those out-of-state. Entry-level jobs start at minimum wage and pay raises are less than the national cost of living, much less the cost of living in northern Michigan. The pay I receive now is similar to what I was making in northern Michigan and I do not feel as if I'm being as stretched financially as I was in Boyne City and Petoskey. There srill is disparity and while I lived in the middle I still have plenty of friends and family who struggle on a daily basis making ends meet in northern Michigan. It is impossible to ignore one simple fact: all of the people who are complaining about the status quo in these counties repeatedly vote for the party that perpetuates the income divide between them and the 'haves". Not that they have a choice, in many of those counties there are only Republican candidates on their ballots until you get to the statewide and higher offices. You get what you vote for. I grew up in rural West Michigan and graduated in the mid 1960s. Tourism and state and Federal forest service centers were the major source of jobs. Little farming and one pallet manufacturing factory since closed. Little has changed in 50 years except the State Forest District office closed some time ago. Most of my generation relocated to Grand Rapids, Muskegon, or Detroit for. Hooray for Mr. Moran. Our community needs someone like him with his drive and vision. So there is so much hardship and poverty in northern Michigan, outside the top 1% or 5% who are wealthy local business owners or visiting tourists... WHY IS MOST OF NORTHERN MICHIGAN REPUBLICAN? Don't you complainers VOTE? In theory, you are the MAJORITY. Everyone is lazy when it isn't a presidential election and we get what we deserve, 3rd world policies. Michigan used to be GREAT when it was progressive. You deserve your fate and so does the rest of our country! Well, it may be great living without when you are young, but when you are my age you will wish you had a pension. You really don't feel like working until you die. Well, yes Bridge is slanted to the left. I gave you the benefit until I read this article. Sorry that people cannot live where they want to but that is life and it has been that way since the beginning of time. You live in a tourist town and I do not believe it is the responsibility of the employers to provide people more than a fair wage. People can purchase items online and in other places so prices need to be fair and $15 labor will make prices unfair. If there are lots of good people that will work for $8 then you may need to educate yourself responsibility to make yourself more valuable. There are millions of free online classes. Take that big, fat finger that you are pointing at others and point it at yourself. Sorry you cannot live where you want to but that is life--stop whining. Oh, and by the way to the teacher that was laid off because of budget cuts--you can thank you union for eating its young. You were probably a great teacher but seniority ruled . Ann Arbor is hiring a bunch of new teachers this year. Move here! Hate to break it to the folks in Petoskey, Traverse City, Manistee, Kalkaska, Cadillac, Boyne City, etc., but you are NOT at the Tip of the Mitt. I get really tired of watching the "Northern Michigan" news stations (that are based in Cadillac). All they talk about are the towns that are in Central Michigan. You really don't hit Northern Michigan until you get to the Mackinac Bridge. Those that live in Central Mich. have no idea of how we live in the North Country. You have more access to stores, malls, health care, etc. We choose to live in a more remote area. Not everyone is cut out to do this. I'm a college graduate with two degrees. After a lay-off (in the U.P.) I worked seasonal jobs just to make some kind of income. We are very independent folks up here. Drive for a couple of hours to get to a Doctor. No pharmacy in our town, have to drive to get to a pharmacy but don't think twice about it. We just do it. You don't hear us complaining. We will stay where we are (no 'relocations' as one writer spoke of several times). People need a geography lessen to learn where "Northern Michigan" really is. You can start with the Governor. Rick Snyder said he went to Northern Michigan to talk about jobs. He went to Mt. Pleasant. NOT Northern Mich. (that's why they call the Mt. Pleasant college Central Mich. University). You didn't come North at all, Mr. Snyder. And for the folks who keep writing about the North and then speak of Mackinac, but write it out Mackinaw, please get the spelling right! Yes, Mackinaw City has the "w" in it, but the Bridge, the Island, the County, are all spelled MACKINAC, WITH the C! We can tell you don't live here when you start spelling, or saying, Mackinac incorrectly. If you don't live up here, don't assume that we don't know what our limitations are when it comes to employment, unemployment, travel, hazardous Winter driving, less pay than downstate and their cost of living. The old saying that "Half the pay is the view of the bay" still holds true. But, you can't live on beautiful scenery. Definitely need to discover the issues of the true North, not just the areas in the center of the state. I know they like to think they are living "up North", but they aren't. Totally different issues for Lower Michigan folk than the Upper Michigan Yoopers, for sure. I think you are looking at people who are older (and wealthier) as compared with younger and unskilled. You don't need a 4 year degree to become wealthy but you do need Skills and a great work ethic. I find it sad that there is always fighting. Just because your opinion is different doesn't mean the other person is wrong. Lived in northern MI for over 30 years now, love every minute. Well I am on the other side of the the coin. I own a home in Antrim County . I find it next to impossible to find anyone to work for me during the summer months,doing odd jobs. Like weeding my garden, speaking wood chips, cleaning up the beach etc. it seems as if all the young people would rather do other summer time activities then doing odd jobs. I pay a minimum of $10 per hour but no takers! Downstate I can always find a high school or college kid that wants to make money for buying a car or paying for insurance,or spending money for the rest of the year. And the professional groups don't gouge me for similar types of work. I a,a handicap senior that pays very high taxes and get very little for that. I support your schools,roads,local governments and various other " necessary " expenses. I truly do not understand how the work ethic works up here. I hired a " great" painter from Traverse City 2 years ago who did the worst job I have ever seen. He would not even answer my phone calls. I paid him after every day's work. It was very shabby, incomplete, and he even stole my marine varnish never to be returned. I now bring my own, craftsmen up here to do what needs to be done, because I know they will have the ethics to,do,the job correctly and with the integrity that a true workman or craftsman has. Don't get me wrong,there are great people here that I respect and love to have work for me. But they are hard to find and expensive. More expensive than downstate. So please change the way you look at work, and there are opportunities out there if you look for them and follow thru with pride in your workmanship and honesty. How can a family of 3 have a tight budget on 75k around here? They must be living way beyond their means. You are not poor in the least bringing in 75k. In all these comments, I have yet to see anyone mention personal responsibility to get an education or learn a skill. There are a lot of comments asking "what will the government do", but I see none that say "what will I do". I grew up as a baby boomer in the late 1940's and 1950's. Maybe we were close enough to the depression to always have our parents mentioning it, but the underlying theme was "if you want things in life, you are responsible to get your education to be able to get them". We didn't go to school to blow off classes or text our friends instead of study. There was a lot of "new" things in life like a crystal radio Heathkit to learn about and assemble instead of a video game on a phone. There were bicycles we rode all over the place, and by doing so kept us somewhat in shape as opposed to sitting in front of a TV or tablet all day. Keeping up with the neighbors because they had as little as we did, I liked the input from the lady who could not find anyone to do simple jobs around her house for $10 per hour, and when she did, could not get a decent result. As an owner of a modest second home in the Charlevoix area, I see things a bit differently. There are many wonderful amenities in this area of the state that are there due to the tax base and the generosity of those have spent summers and weekends there for many years. The public library and parks are exceptional. All there for everyone to enjoy. The main roads and infrastructure are probably the best maintained in the state. Sure young people can't always find jobs and move away-- that happens in every small town in America! Once they go off to college and they see what else is out there many never return or own a second home in that area! That's the way life is in good ole U.S.A! Thank God for other opportunities and in this country with enough ambition you can do anything! Try going to Disney in Florida. Go to the city of Celebration and it will look a lot like Bay Harbor near Petoskey. Only the super wealthy can afford all this. There is always going to be the " haves and the haves nots". Get over it! Make your own way in life. Many of those Northern Michiganers are glad when the "haves" leave in the fall and they can have their small towns with the nice amenities back to their selves! Remember Jesus said in the bible "The poor will always be with you". We are not all the same and not all have the talent or ambition to be financially successful. The food pantries and free meals are well used in down state MI too. And some of them don't own an old trailer on a large country lot with a pick-up truck! They have absolutely nothing and depend on the generosity of others to make it everyday. Drug use is in Northern MI too. People CHOOSE to spend their money on this type of activity. If you are one of the lucky ones to have a good life go out and help those less fortunate and maybe you will make a difference for them! Don't just get on your soap box and crow about it get out and do something to help those you see in need. In the USA you can still go from "rags to riches" last I heard! My son is a manager in Petoskey. 9 out of the 10 applications he receives are from people that are just going through the motions of 'looking for work'. Sorry that you don't want to start at minimum wage, but if you want a better life, you have to pay the piper. My son started at minimum wage and now makes twice that, BECAUSE HE WORKED HIS 'A' OFF. I can empathize with the whole situation that is written here. However, there are similar situations 'up north ' beside the area you wrote about. These situations exist in pockets all over Michigan including the Upper Peninsula. I grew up in the Tawas area, where the findings are quite similar. Many of us 'Tawasians' have left for work in other areas finding it hard to return home. Oh Woe is the operative word. Shame on The Bridge for the article that presents as journalism. The slant of your offerings is getting to be unacceptable. Jobs have been relocating or just disappearing forever. I watched as the quarry and cement plant in Alpena closed due to labor strife. The reopened plant pays better wages under new conditions that the former labor leaders stonewalled. The Harnishfeger plant in Escanaba suffered the same fate never to return. I laughed at the couple's assertions with the challenges at 75K/yr. I think the 'love of snowmobiling' might have something to do with their budgeting issues. We all make decisions that have long lasting ramifications on current and future circumstances. K-12 educations and subsequent studies at good institutions like Alpena CC, North Central CC, or the University Center at Northwestern CC provide great foundations for the dreams of most. They do however require a commitment of time and study, there are no free lunches. I told my son once that money provides choices, if you are happy with $5 for lunch you're limited to the likes of Mickey D's and you only need to work as hard to earn the 'Fiver'; if however you aspire for something better you need to earn say the 'Sawbuck', with which you can patronize a better place or still go to McD's and keep the extra five for something else. The choice is up to the individual as to how much he wishes to invest in himself to provide better choices. Neither result is right or wrong it is just a measurement of the person. And it is not my responsibility to provide for your choices. All successful persons that I have had the occasion to know did not accomplish their success by working 9-5, and all have placed their own 'treasure' at risk believing in themselves and their ideas. Yes, some were lucky, and some did have the fortune of family, but by far most were the result of their personal perseverance. it can be done and still is. My dad, 82, left Charlevoix in his 20s because he wanted to pursue opportunities for an education and success. After a lot of hard work, he did well and returned to enjoy his retirement fishing and golfing. One of my brothers moved up from downstate .... And I've watched him struggle for so long. As an electrician, he could have moved and gotten work but didn't want to leave because of the lakes, etc. There were times he struggled to feed his family. Hard to understand .... But very much a conscious decision on his part. As a professed economics geek, I find this discussion (both the article and subsequent comments) fascinating. I moved away from a poor county in the thumb.years ago to both join the Army and attend school. But, as I have moved up the socio-economic and educational attainment ladder, I also feel that my children are missing out on some parts of the simple yet wonderful childhood that I was "Privileged" to have growing up with fewer financial resources. (Has anyone spent hours jumping out of a hayloft into a pile of hay? I have, but my boys have not). Rural areas will always struggle for stable middle class employment. Surely the coasts nod kake fronts will have pockets of wealth that help to exaggerate income inequality. All states have these areas of disparity. The question is whether the "costs" of a rural lifestyle are equal to or greater than the costs of uprooting and moving elsewhere to an area of greater economic and social opportunity. No one can make that decision other than the individual and/or family. I have lived both sides of the coin and still struggle with the answer. I lived in that area for over 20 years and have worked in both business and service jobs. I am a college educated woman and was downsized from a job due to budget cuts. I then worked 2 service jobs to make ends meet. I find it interesting that some have stated that the solution is to move away. Who would work at the grocery stores, restaurants and gas stations? Every society needs people to do these jobs. Who would serve the affluent then? The problem in that area is not the jobs, it is the lack of affordable housing and the cost of living. I left that area and moved to the UP back to my home town. I took a 25 percent pay cut to do so, but my cost of living went down 75 percent. I am living a dream life here compared to when I living in that area. There is no mall and shopping up here is an all day adventure. There are times when you have to drive quite far for basic things. But the glory in that is I can travel to do the things I love to do. However, I no longer have to put up with crowded summers and holidays and an influx of tourists taking over my town. Some days I am the only person on the beach here. It is quiet here, and we wouldn't want it any other way. Hey Wager family. If you cant live up north on $75000 a year you have major budgeting problems. Maybe you dont need a $150000 house and new cars. Just saying. You should be able to live well on that amount. Yea no Yachts or Jets but you'll never go be cold or hungry. Millions of Americans would be more than happy to be in your struggling situation. You are NOT poor because of the amount of money you make; you are poor because of the amount of money you spend. Spend every last penny and you really have no other choice than to be poor. You don't need more money, you need to learn how to set priorities. A pay increase does nothing to get you out of poverty if you spend it all, you end up just as poor as before. But even so, it takes a lot of work to be poor when you live in God's country. It's difficult to feel poor especially whenever you look out any available window! TWO MICHIGANS. I thought you would write about the Upper Peninsula that isn't on some people's map. Sadly, the cell phone service is not available to many people in certain areas. Remember the story of the two out of state women lost for two weeks last year? Fox News reported: "They thought the road was plowed but it wasn't," he said. There was no cellphone service in the area and the car eventually lost power as well. Roy and Wright wore layers of clothes to stay warm as overnight temperatures fell to the 20s." Really interesting discourse going on here. I've been part of the Summer visitors to Northern Michigan area all my life. I love it there and have managed (barely) to keep a cottage on a lake where I work from every Summer. I plan to make it my part-time retirement home in a few years. I've noticed two trends not mentioned so far - first, although there are certainly very affluent people in Northern Michigan, the family make-up of Summer visitors has changed dramatically along with our society during the last 30 years. It used to be that families would Summer in the lake cottages and that kids would spend their Summers on the lakes. Now, due to the need for dual incomes, the participation of women in the workforce, and the requirement for children to participate in sports and school activities during the Summer has stopped this cherished tradition. Who occupies the cottages? Retirees now do. Northern Michigan has turned largely into a retirement community in that regard, and the average family who used to enjoy that affluent Summer lifestyle is largely a thing of the past. More importantly, there is a new thing called the Internet :). With the right education and sacrifice anyone can become qualified to work from anywhere. It's no longer about the factory that can employ a few hundred people. There are thousands of businesses now hiring tens of thousands of virtual workers who can even live in Northern Michigan. The very premise of the article is that we're somehow stuck in the pre-Internet world of the 1970's where you actually had to show up at a factory or store in order to make a living. The world is changing, and Northern Michigan can change with it. Did you take into consideration that in Harbor Springs, the amount of native Americans that live there? That may be why they have a higher rate of students going to college. I grew up in that area and know the disadvantages that come with tourism. We all do what we can do have the best life possible. I hope this opens the eyes of the people that pass through, but do not appreciate how hard people work to make it a fun place. The last time I counted, Michigan sits on THREE Great Lakes. It seriously amazes me when employers say they can't find skilled trades people, or skilled employees generally. It seems like they forgot that they can train them. If I went into business myself, I would examine this issue/asses the risk before making a commitment. So many people these days, and here I'm talking about business owners, think it's up to everyone else to shell out lots of their own cash and get into debt (for training, say) just for the privilege of working for them. Why don't THEY train people and take the risk instead of thinking the poor and lost middle class can do so (take the risk, even if they're able to somehow)? 75,000.00 a yr is a very good income. Remember it's how you want to live and when you live around a lot of wealth your nice income becomes some to you. So stop comparing and start enjoying! If you looked at Antrim County, you'd see a similar pattern, just south of Charlevoix. Indeed, all the counties in the NW corner have that mix of resort and tourism businesses, coupled with poverty. There are a number of research studies on this, with early ones that include https://dspace.nmc.edu/handle/11045/24118 This historical perspective is useful in assessing what might work today. "The three counties lost 3,603 jobs in manufacturing, construction and natural resources between 2000 and 2013, according to an analysis of federal Bureau...". Says it all. Regulations, regulations, and more regulations have eliminated these jobs from our state. Stop the overregulation and we might have a chance to rebuild. Let's see what President Trump can do when he cuts the regulations put in place by the Democratic rule. Bottom line $2.42 is not a living wage it's not a minimum wage. How does the state of Michigan justify this wage? The liquor distributors, whom all restaurant employees actually work for want it this way. Greed is the problem, can't or won't pay a living wage? Then you're not a viable business you're a racketeer like the distributors. I wish that Presque Isle County was included in the 'tip of the mitt' as we are right there to the east of Cheboygan County. We are in this boat, too. We 'enjoy' some of the highest unemployment in the lower peninsula. I grew up in Chesaning Michigan. Growing up was a good childhood. The town has lost most of the good paying jobs and the people still living there have to travel up to 2 hours of driving to get to work. The town is very uninviting for businesses and residents. I chose to move to West Michigan (Grand Rapids) area because it is a nice place to live and many jobs for those eager to work. I hate change but you have to do what is necessary. It seems like when I stay in a hotel in northern Michigan, all the workers are from out of the country. I understand they are seasonal low paying jobs, but why don't they go to Michigan people before Jamaicans? It's nice to see civil discourse in this thread. I love Michiganders. Workers need to demand a living wage from employers. Yes, some small business owners struggle and sacrifice to get their company off the ground, many make less than their employees at first. There are also many business owners that make a very comfortable living off the backs of underpaid workers. We can talk about risk/ reward and what an entrepreneur deserves for their vision. That's a fair discussion, but in the end, working folks need to expect a living wage. We can do without unions but collectively we need to make sure people working 40hr weeks get fair compensation. I realize this doesn't provide an instant fix for folks who don't have a job at all, but spreading the wealth creates new opportunities. Trickle down economics haven't worked in the past. We need to prioritize community over self indulgence. $14 an hour shouldn't be out of the realm of expectation for Labor. More workforce pay means more goods and services bought and sold! There are several edible parts of a pine tree. My wife Danielle and I were quoted at the end of this article. In August of 2016 we left Northern Michigan for jobs in Lansing. It's a shame that we could not find jobs to advance our careers in Northern Michigan. Mass transit is a nice idea, but only functions with taxpayer subsidy. And it's not "green" when you consider that most buses run at a fraction of capacity in rural areas. Also, the mileage needed to get into the areas where workers actually live in these counties would be prohibitive. I grew up in Petoskey, ("half your pay is the view of the Bay") as did my parents and grandparents. They arrived from Ireland and Germany, to labor in the "industries" of the day-- lumber, fishing and the "tanneries"-- where animal hides were stripped of their hair (dumped into the lakes), cured in chemical baths and worked into leather. After the landscape was lumbered almost treeless, people didn't suffer from Hay fever ( seasonal allergies). City dwellers were persuaded that here was relief-- from allergies, heat and perhaps even polio. Locals leased rooms, opened boarding houses, built small neighbourhoods of "Hay Fever" cottages to earn money from the newest industry- tourism. Soon, large resort hotels and colonies of large "cottages" were commonplace and the economy shifted to a hybrid service/industrial. As the industries of one era -- logging, limestone extraction, cement production -- faded, tourism and service took its place. With the steady rise of the "resort" economy, the two-tier "haves and have nots" were firmly established. As manufacturing faded, retail, health care and other service jobs were growth sectors, fueled by the resort economy and it's wealth. And "development"-- the art of selling land for upscale purposes-- arrived. More money poured into the most "desireable" communities, increasing class differences. By the 1930's, people were leaving, seeking work in the auto factories and other opportunities in cities. That continues to this day. I miss Petoskey-- it's great beauty, the majesty of the lakes and forests, and the charm of rhe town, still not completely buried under the relentless monster of "development". I too, had to leave for work-- but I've never really left. Thank you for an insightful look at a place I love. Real facts and news about real people in my area. Thank you.